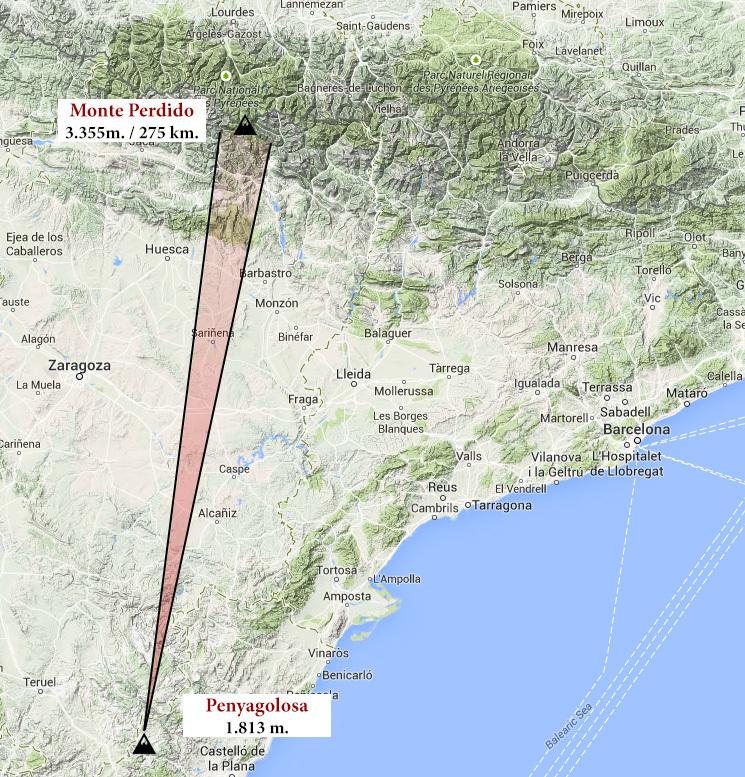 Penyagolosa – Monte Perdido | 275 km. 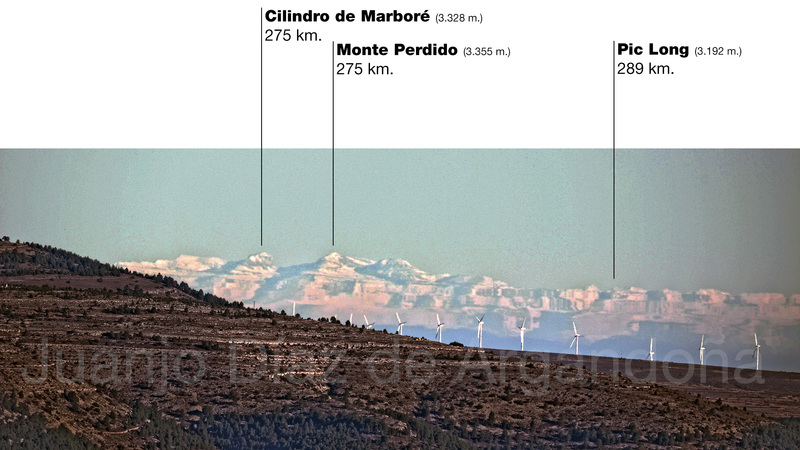 Monte Perdido massif as seen from Penyagolosa Summit in Castellón, more than 270 kilometers away, under warm conditions up in the atmosphere, usually asociated with clear skies and great visibility. First distant sight from me, after days of preparation looking for the perfect place to take the pictures, and the perfect day with clear air conditions. At the time this picture was taken, relative humidity trough all the line of sight was below 35%, and the temperature was not very low, allowing air to decrease its humidity. Penyagolosa summit is easily reachable after some 90 minutes walk from 500 meters below the highest point, requiring no special equipment or material. Pirineos view from its summit is a common knowledge within the people living in the area, but no so many pictures have ever been taken. Further distances were recorded on the picture, almost covering 300 km to Pic Long, nearly hidden behind peaks around Valle de Pineta area. 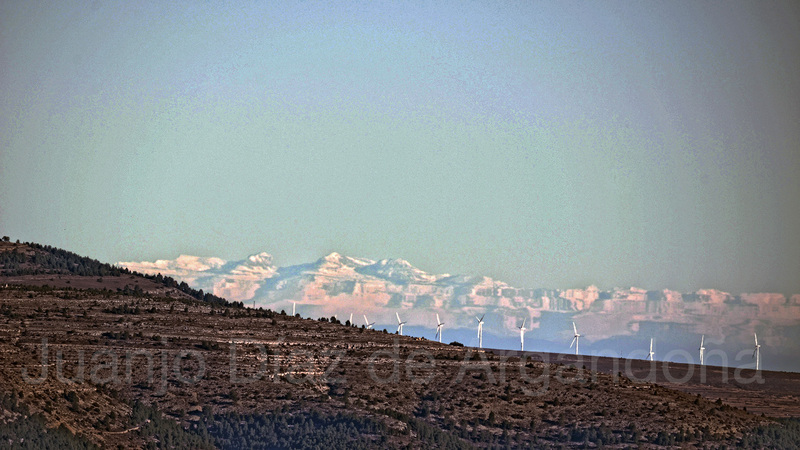 Next > Monrepós – Pyrenees | 75 km.